According to geophysicists with the United States Geological Survey (USGS), the past fortnight has seen Yellowstone supervolcano shaken by a swarm of over 200 earthquakes since February 8, accompanied by innumerable smaller tremors too faint to accurately record. Despite how alarming this cavalcade of seismic activity might seem - considering its unnerving proximity to one of nature's most potentially devastating powder kegs - scientists say we shouldn't be panicked. Researchers Mike Poland and Jamie Farrell from Yellowstone Volcano Observatory explain in a USGS update that swarms like this account for more than half of the seismic activity at Yellowstone, and they've never actually been known to contribute to volcanic activity at the caldera. "This is what Yellowstone does; this is Yellowstone being Yellowstone," Poland told Live Science. "It experiences swarms all the time." 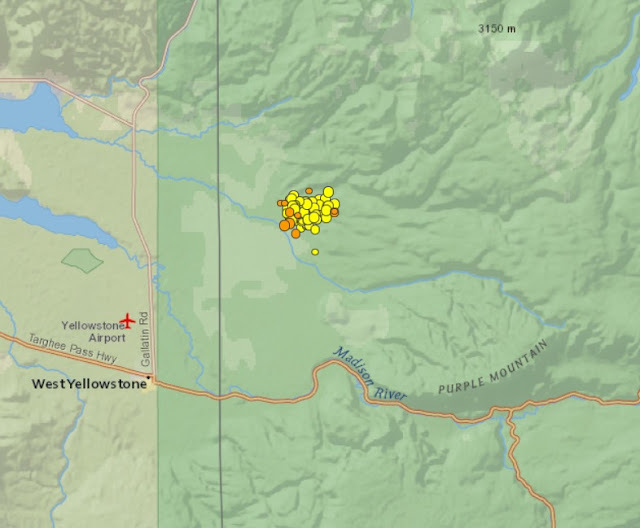 Case in point: last June, the region experienced an epic earthquake swarm that was 10 times more turbulent, breaking Yellowstone records on its way to ultimately producing some 2,400 quakes by September. Ordinarily, the caldera sees around 1,500-2,000 earthquakes per year, with about half taking place during swarms. In the current swarm, the largest earthquake reached a magnitude of 2.9 on the Richter scale, whereas last year's quakes topped out at a magnitude of 4.4. These events might not produce fiery eruptions from Yellowstone's expansive magma chambers, but they're still a valuable opportunity for scientists to study the behaviour of the caldera system. The latest outbreak took place in an area around 13 kilometres (8 miles) north-east of West Yellowstone, Montana, close to last year's 2,400-strong swarm. The researchers say it's possible the new flare-up is actually a continuation of the 2017 incident. That might seem like a long stretch, but on the vast timescale over which seismic activity plays out, it's actually just a blip - and the researchers even say both the 2017 and 2018 swarms may actually hark back to a quake from the previous century. "One of the potential explanations for why this area is so swarmy is that the whole crust in the area is still adjusting to the big earthquake in 1959," Poland told Live Science. That episode, which induced the surrounding landscape to plummet by several metres and provoked seiches (standing waves) on Hebgen Lake for 12 hours, was the largest historic earthquake in the region, killing dozens of people in a landslide. The 7.3-7.5 magnitude earthquake was due to stresses along faults under the region, but Yellowstone is also susceptible to pressure changes beneath the surface due to the buildup and withdrawal of fluids like magma and hydrothermal water, plus gases too. For now, there's no indication that these suspected after-effects are actually a sign of any impending greater seismic activity to come - nor a prelude to an eruption, but if (or when) a volcanic outburst is next unleashed at Yellowstone, it likely won't be the cataclysm many fear, the researchers say. If Yellowstone erupts, it's most likely to be a lava flow, as occurred in nearly all the 80 eruptions since the last 'supereruption' 640,000 years ago," Farrell told Newsweek last June. Of course, that's just likelihood being talked about there. One year or another - although it could be countless millennia away - the supervolcano will inevitably undergo another of its incredibly rare, but unimaginably catastrophic super-eruptions. To give you an idea of how bad that (hopefully very far-off) explosion could be, NASA estimates the global consequences could be graver than a planet-devastating asteroid strike, with ash clouds likely to starve Earth of sunlight in a choking, years-long volcanic winter. The good news is, that's probably not what this earthquake swarm is all about. Right now, we can be thankful that Yellowstone is being sleepy - especially since, even while it's napping, it remains a bizarre and unpredictable place, at turns deadly, surprising, and confounding. As long as it's not super-erupting, we'll take what we can get - and in any case, the latest swarm looks like it could be over for now. "It's slowly petering out, although these things wax and wane, so it's a bit difficult to say that it's ending," Poland told Newsweek. "Yellowstone is just a very swarmy place." Several hidden underground outposts were discovered around Yellowstone National Park. The Cabal-MIC (Cabal-Military Industrial Complex) were attempting to set off Yellowstone Caldera (super volcano) with HAARP weaponry in a last ditch effort to commit martyrdom. "If we can't have it, then no one can." This is the current mentality of the remaining rogue Cabal elements. Alliance Ghost Operative Teams were dispatched to these locations and have successfully destroyed over 4 outposts in the area. There will be way more smaller volcanoes erupting happening soon. Yellowstone is the end game. So either forget about it or find a bunker to live in for a year.